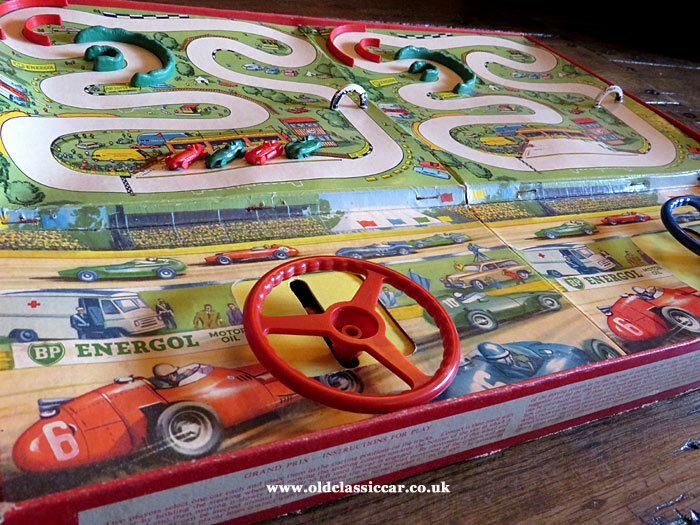 The Merit Grand Prix magnetic car racing game. Homepage. 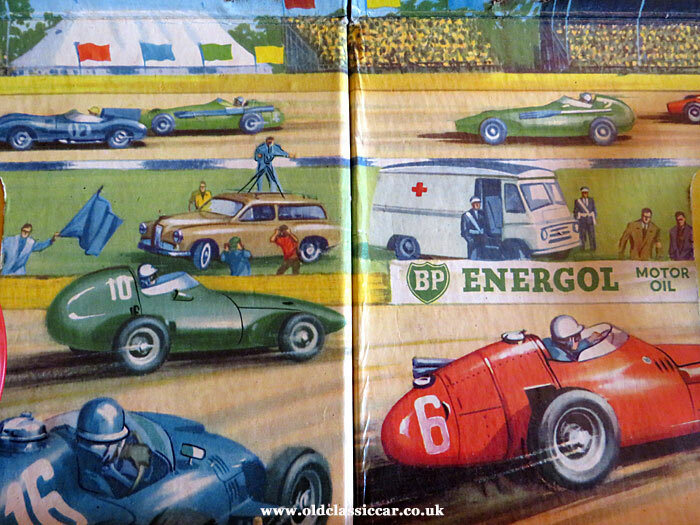 This page: Merit Grand Prix, another magnet-operated car game from the late 1950s. Merit's Grand Prix car racing game. Much merriment and excitement was promised with this dazzlingly-illustrated magnetic car racing game, from the late 1950s. Just like Driving Test, it was produced by Merit, a British maker of toys and games. 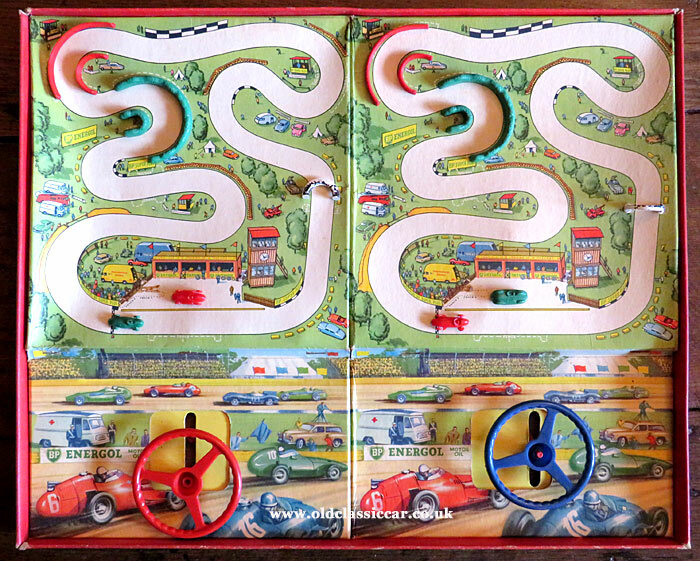 In this version of the game, two players go head-to-head in a tense race that requires both precision and deft hand-eye co-ordination, if plastic hedgerows and fences are to be successfully navigated in the bid to cross the finish line ahead of your rival. The box lid shows three excited children with a very out-of-scale game in play. Two players could race at any one time, yet three children are shown - was the young lad in the centre preparing to shove his little sister out of the way, so that he could take his turn at the wheel? I doubt such uncouth behaviour would have taken place in the 1950s (! ), so maybe he's just helping out with the steering. Saying that, she's doing pretty well anyway, as she's leading the race in her Vanwall, from her rival in his D50 Lancia/Ferrari. No tacky football T-shirts or ghastly ill-fitting clothes for these youngsters, no siree, just shirts and ties for all three #smart. The board is very nicely illustrated. Various racing cars are shown at speed, while in the paddock a couple of transporters are parked up with a pair of cars at rest. Spectators' cars are dotted around the circuit, while a Morris LD ambulance and a Humber Hawk estate TV film car watch on. Signs for BP Energol motor oil are also in evidence. Merit Grand Prix must date to the late 1950s, or possibly the early 1960s. 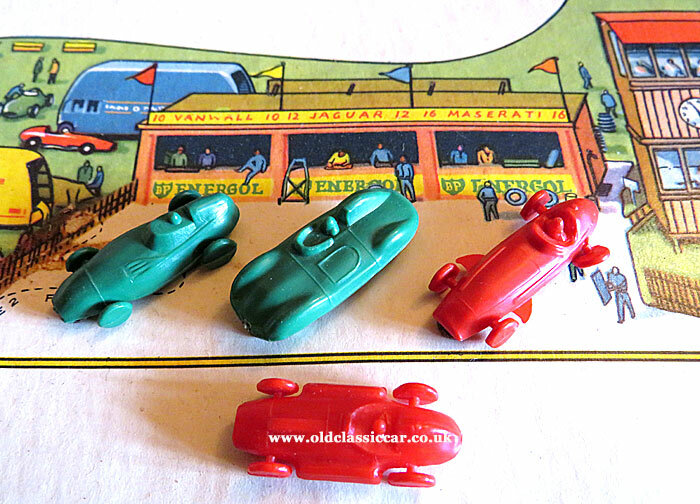 I have four plastic racing cars in this set, each of an actual competition car familiar to motor-racing fans in the 1950s. Single-seaters are represented by a green Vanwall, plus lone examples of Maserati 250F and Lancia/Ferrari D50 (both red), along with - slightly oddly - a Jaguar D-Type sports/racing car. Each is a simple plastic shell, with a metal hoop on its underside, to pick up the magnet as it passes beneath the cardboard base of the game. Each of the two "drivers" has a steering wheel. The wheel slides up and down, left and right, enabling any Stirling Moss-wannabbee to, in theory, control their car as it streaks from the line into the first corner, by moving the magnet out of sight beneath the circuit's layout. Clever stuff. Trying to control the cars, just as in the Driving Test game, is less than easy. I presume the passage of time has made the steering mechanism a little less than co-operative, compared to how it was when it was new, sat on a shelf in a local toyshop. But it still works, sort of, and it's easy to understand how excited any youngster would have been to see this appear, as they unwrapped their present, perhaps on a birthday or beneath the tree one Christmas time. 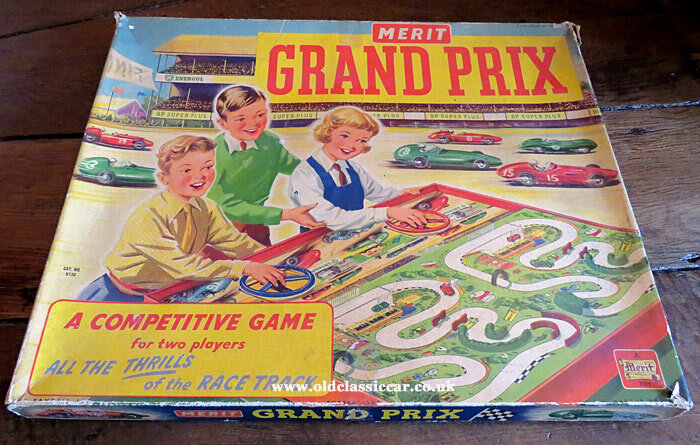 The Merit Grand Prix game is in fact the third such game of its type to feature on the site. The Driving Test game has already been mentioned. To be found on this page is another racing game, this time the Duncan Hamilton races at Oulton Park game. Again it utilises a hidden magnet to control the racing car and, coincidentally, a green Vanwall features in its illustrations. Return to the car-related games section.